1896 (August 14): Eusebio Joaquín González was born in Jalisco, México. 1926: Eusebio Joaquín González founded the church in Guadalajara, Jalisco, according to the official history. 1937 (February 14): Samuel Joaquín Flores was born in Guadalajara, Jalisco. 1942: Eusebio Joaquin González was baptized with the name of Aaron. 1964: Aaron died, and his son Samuel Joaquin Flores became the new Apostle of the church. 1965: The Houston branch of the church was founded. 1969 (May 7): Naasón Joaquín García, fifth son of Samuel Joaquin Flores, was born in Guadalajara, Jalisco. 2005: The Houston temple open ed under the guidance of Benjamin Jaoquín, son of Samuel Joaquín. 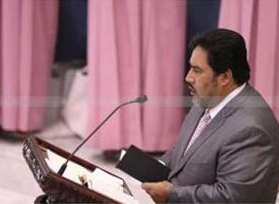 2014 (December 8): Samuel Joaquin Flores died in Guadalajara, Jalisco. 2014 (December 14): Naasón Joaquín García became the Third Apostle of the church. From the beginnings of the church formally known as La Iglesia del Dios Vivo, Columna y Apoyo de la Verdad, La Luz del Mundo (The Church of the Living God, Column and Foundation of Truth, The Light of the World) in Monterrey, the prophet Aaron oddly opted to move his evangelical work north into the United States before continuing south into Central America. He began the spread of his theology in Los Angeles in the mid-1950s and in San Antonio in the early 1960s. Upon the death of his father in 1964, Samuel Joaquin began a new era of the church, promoting the expansion of the church throughout the United States. Between 1965 and 1967, two brothers from San Antonio brought the teachings of the church to Houston. [Image at right] Much as La Luz del Mundo congregations continue to be formed to this day, the Houston congregation started with prayer meetings in a small house (Fortuny 2002). Members from this location have gone on to start churches in other areas of Texas as well as churches as far away as the cities of Atlanta and Miami and in countries such as Israel. The primarily Latin American congregations consist of many individuals and families that migrated to the United States from Mexico, Honduras and El Salvador. A large portion of the members of La Luz del Mundo were former members of the church in their home country and upon entering the United States found a sense of community within the local church. Reagan-era federal laws that questioned the legal status of migrants helped perpetuate the growth of the church in the United States. Much like other Latino Pentecostal churches at the time, La Luz del Mundo congregations became safe havens for migrants with questionable legal standing. Estimates of the numbers of immigrants aided by Latino Pentecostal congregations, as well as La Luz del Mundo, numbers in the tens of thousands (Ebaugh 2002). Though not all migrants who were sheltered by Pentecostal churches converted, a large portion did, leading to a rise in the membership of many congregations. Besides providing the necessities of everyday life, the churches also gave the migrant a sense of community. Arriving in a country where they are now the minority, the church allowed immigrants to maintain some sense of cultural identity. Services provided in the migrants’ native tongue and new arrivals being readily welcomed into the congregation, relieved some of the alienation felt in the new country. Also, the church provided needed resources for the individual to maintain contact with family in the person’s home country. With a vast network of churches that keep in constant correspondence with each other, even across borders, migrants are afforded the ability to communicate with the churches and communities in which they previously lived. Often the churches and the communities benefit from a continued relationship with immigrant congregants, reaping monetary benefits and increased membership. Most new congregations begin in homes of congregants. As the congregations grow, La Luz del Mundo is known to acquire abandoned churches and other buildings. A second congregation in the Houston area moved into a converted movie theater until the church can build a more permanent building. The Central Houston church is of particular importance to the denomination as the late Samuel Joaquín’s son was ordained as the leader of that congregation. 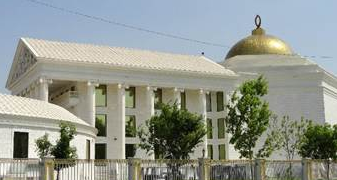 The Central Houston church located in the northeast section of the city began construction on their new golden domed temple in 2000. [Image at right] With donations of time, money, and skilled laborers from the congregation, the temple opened in the parking lot of the former church in 2005. The Romanesque structure, consisting of the temple, classrooms and offices, and a pastor’s house, makes the $18,000,000 compound the largest La Luz del Mundo church in the United States. The facility, enclosed by a white metal fence trimmed in gold, contains a sitting area encircled by fourteen free standing columns, one each for the original Twelve Apostles that followed Christ and two that honor Aaron and Samuel Joaquín (Vara 2005). With one of the largest congregations at approximately 4,500 adherents, the Houston church stands as the flagship temple in the United States. The Houston church, like all of the La Luz del Mundo churches, adheres to the doctrines promulgated by the movement founder. The prophet Aaron preached a specific type of Pentecostalism known as The Oneness wing. This particular form of Pentecostalism rejects the eternal divinity of Jesus, instead believing that it was his baptism that made him the Christ and therefore divine (Sánchez Walsh 2003). La Luz del Mundo ministers, in the tradition of Oneness beliefs, baptize solely in the name of Jesus Christ instead of the Trinity: God the Father, the Son, and the Holy Spirit. Similar to other Pentecostal denominations, La Luz del Mundo insists its adherents follow strict codes of conduct. Services are separated by gender, with women sitting on the left and men on the right side of the temple; both the congregation and choir are segregated as well . Women are instructed to wear long full skirts, traditional head coverings, or veils, while in the church and, similar to traditional Pentecostal teaching, do not cut their hair nor wear make-up or jewelry. Men of the faith, however, are not expected to follow a dress code, with the exception of a ban on long hair (Gonzalez 2008). Though women play an important role in the organization, administration and coordination of events that take place in the community, female congregants inhabit a lower status in the church in comparison to male adherents. Women can be obreras , a form of missionary or evangelizer, who occupy the lowest rung of the church hierarchy, yet are excluded from being ordained into the priesthood. Also, since the early stages of La Luz del Mundo, women have led exclusively female prayer services (Fortuny 2002). A primary concern of La Luz del Mundo congregations is an active community service program. Temples focus on feeding and clothing the less fortunate of their members, promote education amongst its youth, and provide assistance in the assimilation process for new migrants. Members who migrated to the United States from other congregations are met with a highly organized immigrant aid effort that aides in finding food, shelter, and jobs while also helping make connections that make the transition much easier (Fortuny 2002). The idea of community transcends race and nationality and is better understood as the nature of the denomination rather than simple community activism. La Luz del Mundo congregations are close knit communities where large portions of the adherents live within close proximity of their churches. The members of the Central Houston church primarily inhabit the neighbors directly surrounding the Bostic street location in the northeast part of the city. Congregants primarily associate with other members, opting to limit outside interactions to work environments only. Adding to the idea of community, La Luz del Mundo promotes endogamy, the practice of marrying within one’s own community (Fortuny 2002). Thus, many congregants marry only within the denominational membership, including individuals from other churches in the La Luz del Mundo network. Daily worship services at 5:00 and 9:00 A.M. and 6:00 P.M are offered at the church which encourages congregants to attend daily. Estimates of members present on a daily basis consist up to sixty percent of the congregation. The services in the churches are void of any instruments as they are viewed as an abomination to God. However, congregations have choirs which perform traditional hymns as well as their own distinct hymnology developed by members. As churches find more permanent residences, many are capped with Aaron’s rod. The rod stands as the symbol of the church as a representation of God’s power to bring spiritual life to believers. It also doubles as a remembrance of the founder of the faith (Vara 2005). Though the different member churches of La Luz del Mundo maintain the hierarchy established in Guadalajara, each individual congregation has a measure of autonomy. Each church appoints its own ministers and missions and acts as an independent body (Fortuny 2002). However, the Hermosa Provincia provides instructional and doctrinal leadership and maintains close ties with each congregation . While the minister of the Central Houston church, Benjamin Jaoquín, [Image at right] was appointed and ordained by Samuel Joaquín, lay ministers have started most of the congregations and later received ordination. The Central Houston church acts as the regional center for Southeast, Texas. The fact that the church has a reputation of being close knit and somewhat skeptical of outsiders, ha s led to accusations that the denomination is a cult. The lineage of the hierarchy of La Luz del Mundo consisting of one family has raised questions surrounding the legitimacy of the church as a true religion. Adding to the controversy is the ownership of an animal preserve outside Sequin, Texas by the church. Suggestions that Samuel Joaquín used the property as a personal compound and continuously refused to open the preserve to the public, only fueled speculation of the church as a cult. Along with being branded a cult by members of more mainstream denominations, La Luz del Mundo has been plagued with accusations of sexual and physical abuse of members. Though no evidence has been provided to substantiate these claims, the denomination continues to face the same scrutiny other religious sects have combatted through American history. In 1998, the church faced backlash from the community in Ontario, California. After purchasing property for the construction of its thirty-ninth congregation in Southern California, La Luz del Mundo received increased skepticism over its motives. Plagued by accusations of sexual abuse and fears from the recent Heaven’s Gate suicides, the construction was halted (Sheridan 1998). The church proceeded to file suit against the city and finally reached a settlement in 2000. However, with all the accusations levied against the main church as a whole, the Houston church has succeeded in distancing itself from the brunt of the controversy. The main complaint against the church has come from citizens that consider the architecture too opulent or obtrusive. These concerns are minor in comparison to the allegations that faced by the larger church as a whole. Image #1: Photograph of Central Houston church. Image #2: Photograph of dome and Aaron’s rod, Houston, TX. Ebaugh, Helen Rose and Janet Saltzman Chafetz, eds. 2002. Religion Across Borders: Transnational Immigrant Networks. New York: Altamira Press. Fortuny, Patricia. 2002. “The Santa Cena of The Luz del Mundo Church: A Case of Contemporary Transnationalism.” Pp. 15-50 in Religion Across Borders: Transnational Religious Networks, edited by Helen Rose Ebaugh and Janet Chafetz. Walnut Creek: Altamira Press. Gonzalez, Ondina E. and Justo L. Gonzalez. 2008. Christianity in Latin America: A History. Cambridge: Cambridge University Press. Sánchez Walsh, Arlene M. 2003. Latino Pentecostal Identity: Evangelical Faith, Self and Society. New York: Columbia University Press. Sheridan, Mary Beth. 1998. “A Growing Faith–and Outrage,” Los Angeles Times, March 18. Accessed from http://articles.latimes.com/1998/mar/10/news/mn-2736 on 23 June 2016. Vara, Richard. 2005. “Lighting Up Their World: La Luz del Mundo Prepares to Dedicate New Church Facility.” The Houston Chronicle , July 23, p. 2. Wyatt, Timothy. 2011. “Iglesia de La Luz del Mundo.” Houston History 8:2-9. Accessed from https://houstonhistorymagazine.org/2012/01/volume-8-number-3/ on 23 June 2016. Wyatt, Timothy. 2011. “Importing Faith: Transnationalism in Mexican-American Pentecostalism.” Paper presented at the Annual Meeting of the Rocky Mountain Conference for Latin America, Santa Fe, New Mexico.